Hockey Canada and the IIHF couldn’t ask for a much better finish to a great tournament in 2015. The tournament itself was one of the better ones in recent memory as the divide between teams shrunk once again. For one Denmark actually competed in only their third time in the top tier of the tournament and won their first game in the top tier. Meanwhile last year’s champions took a fall in the standings and while the usually solid Czechs did the same. The Russians were not great in the round robin but picked it up in the playoffs and the Slovaks became favourites for the crowd, mainly due to goaltender Denis Godla. 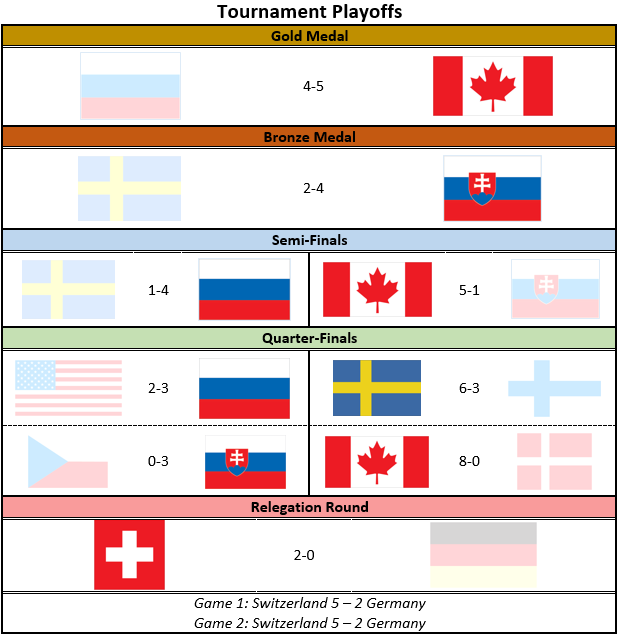 As the playoffs began it looked like it was going to be a Swedish and Canadians final as neither had lost a round robin game. Then came the Russians who eliminated a very good American team and then took out the Swedes. They looked to be turning it on at the right time and seemed like the old, dangerous Russian team that had won so many golds before. On the other side of the bracket the Canadians had a bit of an easier time taking on Denmark and Slovakia who put up good fights but couldn’t overcome the powerhouse. As the tournament wound down it was Switzerland and Germany facing off for relegation, with the Swiss coming out on top and the Germans being relegated. In one of the bigger surprises of the tournament the Slovaks were able to get by the Swedes to claim the bronze, only their second medal in the tournament. The gold would come down to the two most successful programs in the World Juniors facing off for yet another gold medal. The tournament had already been great up to the gold medal final and to finish it all off was the biggest rivalry in hockey with a packed house at the Air Canada Centre. The Russians and Canadians have had so much history in major tournaments that it is almost hard to list and the Juniors are no different. The Russians, including the Soviet Union, had won a total of 13 gold medals including six of them where the Canadians finished in second place. The Canadians had a total of 15 gold medals heading into the final but were on a five-year gold medal drought. They looked like the best team put together since their last gold medal though as they seemed on their way to breaking the streak. In their way stood the thorn in their side though as the Russians had been there to end the Canadian chances of a gold for the last few years. Last year it was a bronze medal that the Russians claimed against the Canadians. Every time these two teams faced off it was an instant classic and year after year it seems as though the Russian-Canadian game is the game to watch. It was no different in 2015 when the Russians and Canadians once again met for a gold with the Canadians trying to break their drought and the Russians trying to spoil the party in Toronto. The game started out terrible for the Russians as Canada scored on their first shift and quickly followed that up with a second goal. The Russians were down early and in response they pulled their goaltender after just under three minutes. Russia had to find something to get back in the game and they did just that as the tide began to turn and the Canadians began to get sloppy. The Russians took advantage and scored to bring the game within one. The second period began with the Russians looking like they were taking over but once again Canada got out to an early start. The Canadians opened the period with three goals and got ahead 5-1 in what looked like Canada’s game to win. They should have learned from previous matches with the Russians though as the Russians scored 5 goals in the third period of the 2011 gold medal game against the Canadians to win the title. The Russians mounted a comeback late in the second scoring three goals before the period ended. As the game headed to the third period it was 5-4 for the Canadians who were barely holding on as the Russians had all of the momentum and were only two goals away from taking another gold medal. The Canadians remained on the edge throughout the third period and despite a number of good chances they kept the Russians on the outside. With time ticking down the Russians pulled their goalie and Canada continued to miss the net unable to put the game away. With the Russians attacking the Canadian defence stood tall and in the end they were able to hold their rivals off to take the gold medal. The Canadians had broken the drought and finally found their golden touch after five years of five years without the gold medal and two years without a medal. The Russians put up a great fight and once again put on another amazing chapter to the rivalry between the two countries. It was a great finish to a great tournament and there was no better way than to end it with the best rivalry in hockey as this tournament only gets better with age.